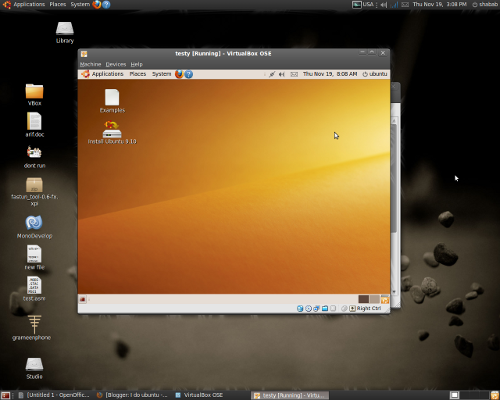 This tutorial clarifies on how to install a different OS inside VirtualBox. 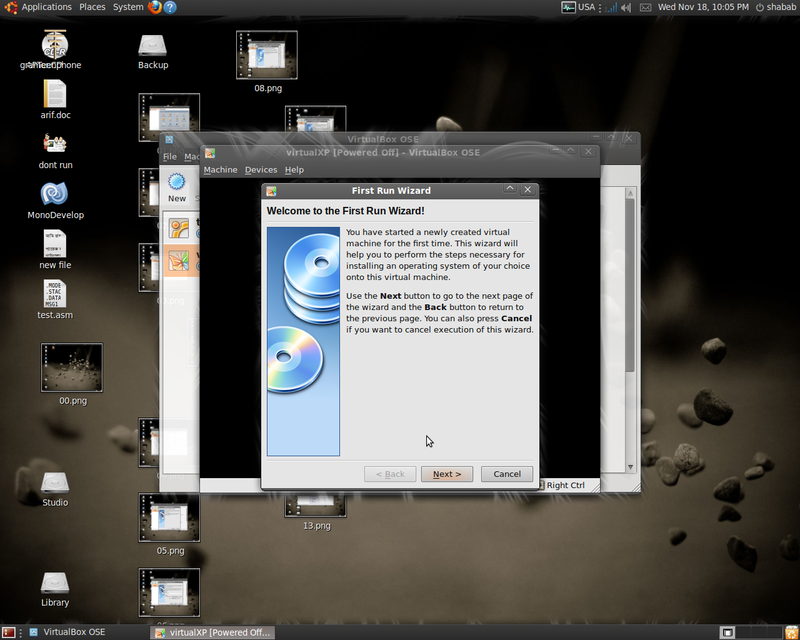 This particular tutorial is based on VBox OSE installed in Ubuntu Karmic, still would be able to cover other similar systems even inside windows. 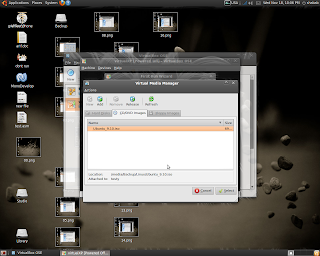 The left side panel shows the available virtual machines. I have a machine named 'testy' (in fig) The right side shows its description. By default there will be no installed Virtual system. To create a new system click on "New". 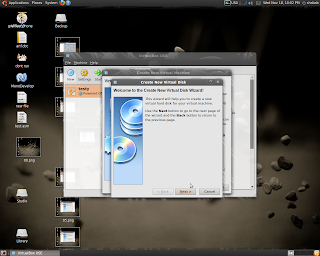 The "Create new Virtual Machine" dialogue appears. Next dialogue shows how much of the main memory (RAM) would you like to give to the VM. 256MB is usually enough but would be a little slower, increase it as you wish. If you have a RAM of 1024MB then dont exceed 512MB. click next two times to continue. Set the location "Where the Virtual Disk will be saved" and the size "Size of the virtual disk". Depending upon what OS you are willing to install in the system you can set the size. 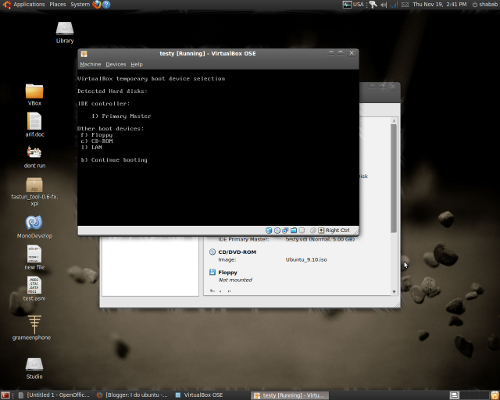 The Virtual disk will act as the Hard disk of the VM. And always be sure that you have enough space int the directory. 4GB will be enough for XP. Click next and Finish to build the Virtual disk. And finish again to create the VM. Select the installation CD of the desired Operating system. Mark the CD-ROM device. 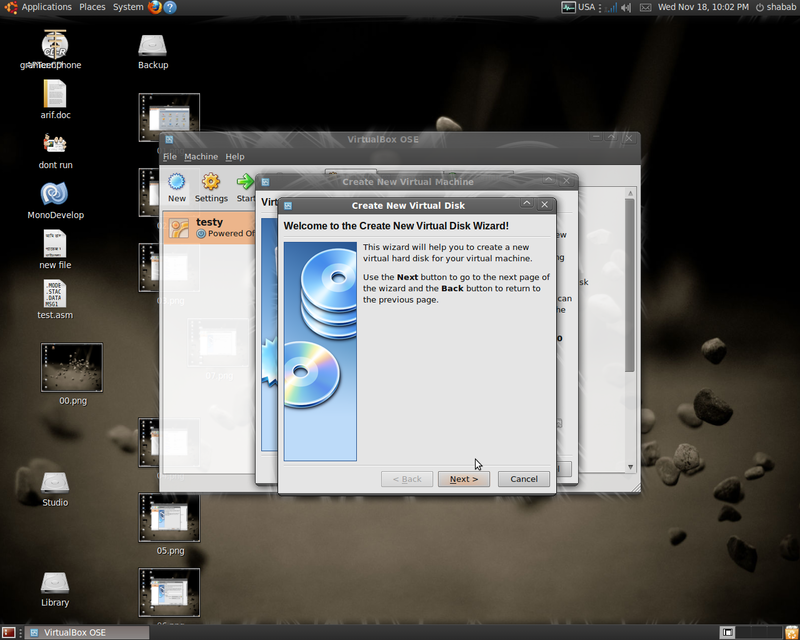 Mark the "Host drive" if you want to allow the VM to use your physical CD-ROM(You may have to select the device from drop-down menu if multiple devices are connected). 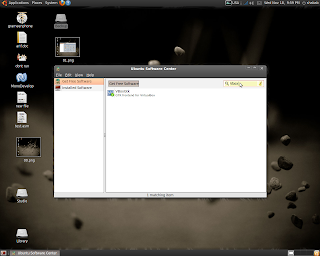 Click on "Add" and browse to select your iso (xpsp2.iso,..ubuntu910.iso..) and click select. finish to go the VM. The VM will act just like a PC. You can enter bios and set the boot priority. and install XP or whatever OS you want just the way you install in a original system. Sun Microsystems has developed this to work in different platforms. It is still under development so try to stay updated.